There was a girl named Mary Lennox. Mary was born in India, her hair was yellow, her face was yellow, she had a little thin face, and a little thin body. She was a disagreeable looking child, and she wasn’t very nice. Her mother didn’t take care of Marry, and she went to parties all the time, so Marry had to go to her uncle, Archibald Craven’s house. She was taken cared by ayah, but one day everybody died , because of the cholera, so she hid in the nursery, but everyone has forgotten her. The house-keeper’s name is Mrs. Medlock. Mrs. Medlock and Marry went to the station and ate their lunch. They drove to the Misselthwaite manor. It was raining, and the wind was strong, it made a strange sounds. She went back, and slept at her room. Mary was sent to an English clergyman’s house because her Ayah and her family were all dead for cholera. In the clergyman’s house, Mary gets teased by the clergyman’s children. She gets a nickname from them which are, “Mistress Mary,” and a song. Then, Mrs. Medlock comes to pick Mary from the clergyman’s house. Then she finds out that the owner of Missethlwaite Manor’s wife died. The house-keeper’s name is Mrs. Medlock. Mrs. Medlock and Mary went to the station and ate their lunch. They drove to the Misselthwaite Manor. It was raining, and the wind was strong, it made a strange sounds. She went back, and slept at her room. Mary goes to the Misselthwaite Manor and finds out it is far away from cities. She also finds out that she has to learn some basic things like changing her clothes by her self because her Ayah was changing her clothes in India. Also about shoes. She also finds out that there is a garden that has hundreds of room. She hears that there is one door that has been shut for 10 years. She travels in the garden that has many doors. Then she ends up in a wall with no door finally. But over the wall, she finds a tree and a bird in the tree. Then she finds a man called Ben who is a gardener of Misselthwaite Manor and finds out that the gardener, Ben, is a friend with the bird. She heard that Ben got friend with the bird because when the bird was a baby, Ben helped the tired bird. But while helping the bird, the other birds, which is the family of the bird flew away and the bird became lonely so the bird came back to Ben. Mary woke up and ate her breakfast, then decided to go out and it was the best thing she’d done in her life. Mary didn’t have anything to do, so she went outside and talked with Ben. Robin and Ben were talking. Robin started singing and it reminded Mary of a tree in a secret garden. Robin lives in that tree. The secret garden doesn’t have any door, but ten years ago, Craven had the keys and he buried it somewhere. He buried the key, because his wife died at that tree, so he hated the secret garden. Mary got back and she heard someone crying, but Martha said it was just a wind. It is raining outside and Mary is board. She asks Martha what she can do inside the house. Martha suggests Mary to read some books but Mary hasn’t got one. Martha remembers about the library in the apartment. Then Mary comes up of an idea to search in the apartment and check if she can count all the doors/rooms. As she travels through the apartment, she found a mouse. She wishes to be a friend with it but she can’t because the mouse is afraid of her. Then she got tired of traveling so she starts to go back to her own room but loses track. Then suddenly, she hears a crying voice. Mary tries to find it out but then, Mrs.Medlock appears and takes Mary back to her own room. Martha had a day out, so Mary was alone. She went straight to the secret garden and she found Ben, so they talked. Mary asked Ben where the key is buried, but he said he didn’t know. Ben told Mary to ask Robin. Robin went into the garden, and he started digging and got something like a ring. It was not a ring, it was a key for the secret garden that was buried from ten years ago. Mary found the key that looked like it was the secret garden’s. She thought of it and decides that she will keep the key for if she finds the door to the garden. Then, she finds out that Martha went back to her house and bought a jumping rope for Mary. Mary did not know how to use such a thing so Martha teaches her. When she tried it, she found out that it is fun to play with it. Then she meets the robin. She asks to lead her to the door. When she goes near the robin, a wind rushed, and she saw a door knob. She grabbed it and found a key hole so she tried the key. Then she was in the secret garden. It was the sweetest and most mysterious looking place. Mary found a few sharp, pale green points in the garden so she thought even the roses are dead, some other things were alive. She weeded out the weeds and the grasses. She went back to her room. Mary and Martha started writing a letter to Dickon to ask him to buy garden tools and seeds for her. Mary is in the secret garden. She feels a lot of things. She remembers that she is the only one to go into the garden for the last 10 years. She feels happy. 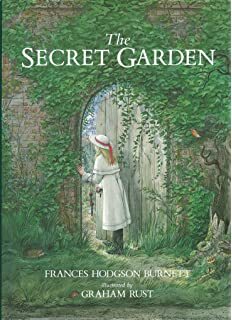 She also remembers that if she was seen or caught going in and out the garden, she might be scolded and the key to the secret garden might get changed so she remembers to be careful about not being seen or noticed by people. Mary was always exiting to go to the Secret Garden and she changed a lot. She got more outdoor and she could skip around many times. She pulled out the weed all thye time and having fun. Mary and Ben is friends now, they talked about gardenings together. Mary asked him about roses and many other things. This page was last modified on 17 January 2018, at 22:42.